The Port Chicago 50 opened my eyes to historical facts and events of which I was totally unaware. I was outraged when I finished it. I was frustrated and uncomfortable and feeling like I should DO something about a glaring injustice that–although instrumental in changing the treatment of Black Americans in the U.S. military–remains to this day. During World War II black Americans were allowed to join the Navy, completed all the same basic training as whites–although all training and barrack facilities were separate–but were only allowed jobs cooking and cleaning if they were allowed on a ship at all. Most, who had joined in order to fight for their country as soldiers in the military, were relegated to menial labor jobs on land at Navy bases. When incidents of racial violence and discrimination occurred and would temporarily gain publicity the Navy’s response was always that : (1)segregation is a part of American society; (2) it was not the Navy’s place to change society; (3) we are in the middle of a War and can’t afford to allow the War Effort to be sidetracked by something that is a fact of life and can’t be changed anyway. They turned a deaf ear and a blind eye to the blatant injustices committed against young men who were conducting themselves with grace and courage under the name of the US Navy because they were black. The Port Chicago base loaded ammunition onto the huge tankers that would then take it to the soldiers fighting at the front in World War II. White Navy officers commanded the units but only black Navy seamen loaded the ships, handling the huge incendiary devices–bombs–some with fuses already attached. The men were given no training on how to handle these massive explosive devices and, inevitably, on July 17, 1944, there was an explosion. The men in their barracks off-shift were blown from their beds and had to escape collapsing structures. The tanker that exploded–with over a million tons of explosives on board–had disappeared from the now-destroyed pier. It wasn’t torn apart and floating in the water: it was completely GONE along with every single man aboard or loading on the dock. In light of this horrific event combined with the fact that had never been given training and were pushed to load at an unreasonably unsafe pace resulted in heightened fear in the survivors on the base that day. When transferred to another Navy base and given the order to march to the dock (with the intention of being ferried to another ship to load ammunition) several of the Port Chicago men refused the order. Initially 258 out of 328 sailors refused the order. We didn’t even know what mutiny meant….We thought mutiny was something like when you kill people or take over something. We didn’t know you could define disobeying orders as mutiny. We thought mutiny could only happen on a ship….I’m not going to give them a chance to shoot me….I’ll go back to work. I concentrated on what he had said…then I went back over to the other side. I realized the order could be to load ammunition, and that’s one order I wasn’t willing to obey. All 50 were all charged with and convicted of mutiny in a military trial. Their decision, their trial and their courage to stand up for what was right began to change the Navy’s attitude toward segregation. They realized that segregation was actually hampering the War Effort and began putting black AND white soldiers on Navy ships working and living side by side. The Navy became the first branch of the US Military to completely abolish segregation throughout its operations in February 0f 1946. Seems like it should be a happy ending. But for the Port Chicago 50 it was not. Although their situation had shown the Secretary of the Navy, James Forrestal, that he needed to change unjust policies and behaviors he refused to publicly admit any wrongdoing by the Navy. Overturning the 50 mutiny convictions would have done this. In May 1945 after Navy lawyers reviewed the trial transcripts–at the urging of Thurgood Marshall–Secretary Forrestal sent a memo to Admiral Wright saying the court had made a mistake. The Navy judges voted to uphold all 50 convictions claiming “Racial discrimination was guarded against.” The Port Chicago men spent 16 months in military prison and then–because there was still such outrage over the injustice done to them–Secretary Forrestal ordered them spirited away in the middle of the night and put on different Navy ships to serve out the rest of their Navy career back in uniform. They were discharged “under honorable conditions” but the mutiny conviction remained on their records, allowing them access to some veterans’ benefits, but not the GI bill which would have allowed them to go to college. Family members and activists are still working to convince the Navy to exonerate the men, but it’s far from certain the Navy will ever agree to reopen the case. All of the Port Chicago fifty have died. All fifty remain convicted mutineers. I was fighting for something….Things were not right, and it was my desire to make things right. I have never felt ashamed of the decisions I made. I did what I thought was best, and I did it in the best way I knew how. During one of their many conversations Small asked Alex what it was that had caused him to change his mind about befriending a black man. The Port Chicago 50 are American heroes. Their actions and sacrifices pre-dated Rosa Parks and Dr. Martin Luther King, Jr. and the landmark Brown v. Board of Education. Their actions, probably more than any other, resulted in the successful desegregation of the Navy and eventually to the entire US military and yet our country records them in history as traitors. Their names and their struggle are not taught in most classrooms. 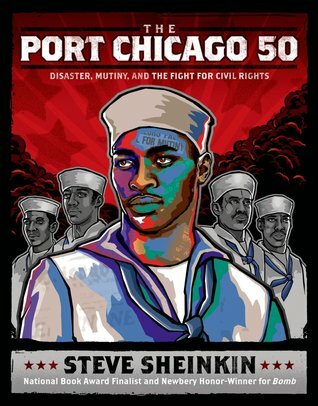 The Port Chicago 50 is a work of nonfiction that is brilliantly crafted from a structural and plot perspective. I read it in a day and a half. This book does the Port Chicago 50 proud. It tells their story with historical details and plain easily understandable language. I HIGHLY recommend this book as an independent or read-aloud choice. I think every classroom should have this book on the shelf; I intend to use it as a read-aloud in classrooms this coming school year. It left me feeling outraged and motivated to DO something to help right the wrong that has been done. I don’t know exactly how to go about that, but I am looking. A book that engenders such passion and motivation to action in its readers is extraordinary. I believe everyone who reads it will find The Port Chicago 50 to be such a book.